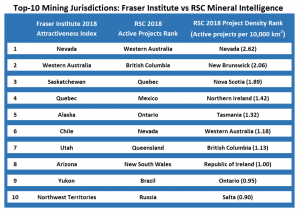 RSC analysed the world’s mining jurisdictions for active project quantity and geographic project density based on public reporting in 2018, and compared the results to the Fraser Institute Annual Survey of Mining Companies 2018 — Investment Attractiveness Index. The Investment Attractiveness Index takes both mineral and policy perception into consideration. Canada, USA, Australia, and Argentina are divided into individual provinces and states. RSC ranked each jurisdiction by: (a) counting the number of projects that publicly reported in 2018, to provide a measure of overall activity; and (b) dividing the number of projects by the land area of each jurisdiction, to give a measure of mineral project geographic density. RSC compared these rankings with the Fraser Institute’s Investment Attractiveness Index and identified key differences between ranking system results. Thanks to its tiny 14,130 km2 land area, Northern Ireland managed to ambush its way into fourth place for mineral project geographic density, based on a small number of actively reporting projects. Meanwhile, with 1.8% of Earth’s land area, Western Australia attained sixth position for project density. The five greatest positive and negative anomalies are shown in the tables below. 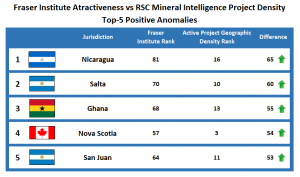 Nicaragua, Salta (Argentina), Ghana, Nova Scotia (Canada), and San Juan (Argentina) are all relatively low on the Fraser Institute ranking but have a comparatively high project density rank, indicating that companies find them worthwhile regardless of perceived attractiveness. On the other hand, Alaska (USA), Northwest Territories (Canada), Nunavut (Canada), Russia, and New Mexico (USA) appear relatively attractive areas according to the Fraser Institute ranking but that attractiveness has translated poorly to geographic density of active projects. This indicates that companies aren’t seeing the prospectivity in these jurisdictions despite the high mineral and policy perception indicated by the Fraser Institute ranking. 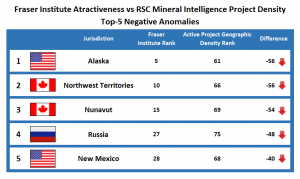 Get your own insights from RSC’s Mineral Intelligence at www.rscmme.com/intel.